I hate to admit it but I’ve gotten caught up in the busyness of the season. My sister and I are entrepreneurs after all and it’s very hard to take a breather and slow down. We’ve written about this topic before here, here, here, and here but every time we go through it, it seems to feel different. This week-end we are doing a very merry Etsy Pop Up Market (my sister is the Victoria Etsy lead). Today is the first day and we are here for 2 more days right in the core of downtown. We are at 547 Johnson Street Dec 18th-20th. The hours are Saturday 11-6pm and Sunday 11-5pm. If you are local pop by and say hi, we’d love to see you. This time of year there is always something pulling at us or begging for our attention. It’s like that all year long but leading up to Christmas it’s especially busy with last minute orders, wholesale accounts, managing 3 online stores and doing local markets 6 months a year. This 3 day week-end is our last venue and we are longing for a day of rest. My sister and I joke that a vacation for us is a day at Costco which is a mere 25 minutes away. It’s really not a joke because that often is a real treat and holiday for us. So yes we’ve been caught up in the back backing stress leading up the holidays. There is always one more order to fill or one more errand to run and while we are extremely grateful we are longing to slow down just a little bit to recharge and renew our minds. Tonight while walking to get a cup of tea I marveled in the beauty of the Christmas lights in the city. For a few moments I let myself get caught up in that moment and a smile crept across my heart and I felt happy to be right where I was and in a city I’ve grown to love. My advice for this crazy season is to enjoy every moment and appreciate those around you and the beauty that is everywhere. 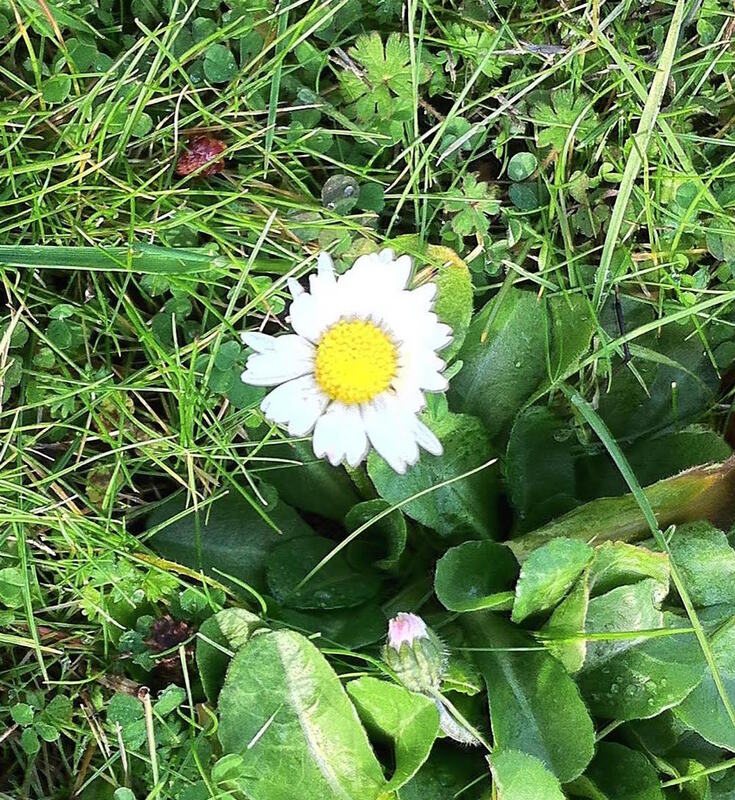 In fact the other day I walked outside and saw a tiny little daisy coming up from the grass. It was delicate and pretty and I thought to myself this is a Christmas miracle. It may sound trite but at that moment I found that little flower so pretty amidst the cold and dampness of the season. Hi, I'm Michelle the artist, visionary, creator and designer of Two Blooms Design Studio. I moved from a big city to Vancouver Island and fell in love with the west coast. My world is surrounded by beautiful scents, on trend design and endless possibilities. One of the blooms of Two Blooms Design Studio hand crafting products that enhance senses through beauty. Duties include: designing branding, natural essential oil blends, production, cutting, labelling, social media, customer service etc.